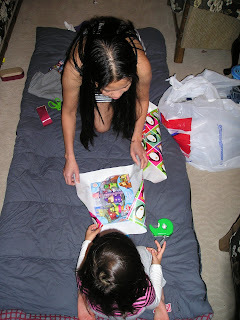 Does gifts really important during Christmas? I know for sure that it makes children so happy but what about adults? I don't care about gifts, I just do it for my children's enjoyment. For me, gifts isn't really important in celebrating the real meaning of the occasion... what is your take on this? 100 % agree with you! i don't care about presents, the only reason i care about is when i make my wonderful hubby and my lovely daughter smile and happy this holiday. I don't have your e-mail!! Please have a look at the right side of my blog and check “Season’s Greetings”! Click on the picture which was taken from your blog. I agree with you, gifts are not really important. But I give good gifts to my love ones to make them happy anyway. My son and wife are both easy to please even with little gifts I give, probably its the action I did that really make them happy, more than the gift itself. 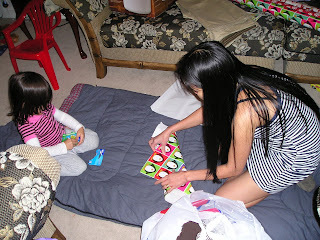 I am glad to know that there are Filipinas like you and my wife who doesn't care too much about gifts. I know few of some in the past that they are very particualr with it hehehe.. Thanks Youngest! Thanks Philip, have a blessed Christmas! Likewise Gregchai, have a blessed Christmas! Hello ms. Cecille, thanks for the greetings.. Merry Christmas from my family to yours too! That's very true Mr. Pastilan, its the love we have for them that counts.. My wife and kids are the same too! Likewise Ms. Lovely have a blessed Christmas to your family too! thanks for visiting my blog and everything else joops. also added & follow your blog. hope you & your family have a wonderful christmas and happy new year! 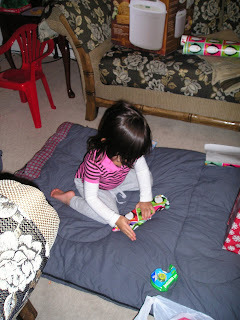 I love to see kids when opening the presents.. I could tell how happy they are every time their eyes lit with joy once they received gifts from us..
Merry Christmas. I think adult enjoy receiving gifts as well as kids. Hi Joops, re gifts...no matter the Season or occasion, its always the thought that counts, ha ha. Here's wishing you and your beautiful family Seasons best greetings, a merry Christmas and a wonderful new year, Lee. hi...merry christmas also to you and your family & freinds outhere,wow!lovely kids..hug and kisses for them!Thanks!.its a big pleasure to have you visiting my blog.Your blog was so organized,very-very nice.i love to see all those pictures,very nice .......i want to follow and pls Xlinks so that I'm always be here.God bliss guys. hhhmmmm...you've got a secret!..we'll find out...hehhe! well, christmas nowadays is getting commercialize....presents are just material things..what matters the most is the love within your hearts. I hope you guys have a wonderful christmas! Happy Christmas!!!!!!! Take care always!!!! You are a good father. Only giving and not hope the reply. Merry Christmas to you and family. merry christmas yeah your right the kids love and enjoy if they have gift not adult hehe happy holidays and more coming blessings..
Merry Christmas to you, your family and friends. God Bless! Wow galing naman...dapat ganoon lahat mga parents noh? Ako naman , i don't care kung meron akong gift o wala , basta lahat ng family ko masaya sa binibigay ko. Merry Christmas to you and your family. Thank you ms. lovely for following my blog, for visiting and commenting and for the lovely greetings! I love to see the facial expression of the kids in the Philippines because even if the gift is so simple they are so happy, unlike in the commercialized world US, they are unhappy if the gifts isn't the one they wanted... Can you believe that? Thanks Umma! Yes its true Willie, but sometimes adult should just concentrate on how they can make their kids happy rather than their own selves right?